Image credit: NASA. Woohoo, NASA! Update: Check out below what you see in the above graphic, except that it's a real image of the real rover with its real parachute, heading for the surface of Mars! 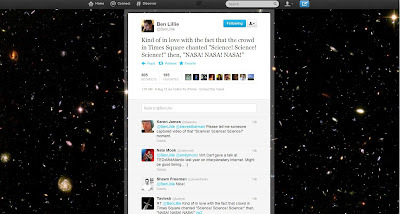 Image by way of the Bad Astronomer, a.k.a., Phil Plait. Because we are freaky, geeky, and totally tweaky excited about the Mars Curiosity landing (woohoo! ), today we bring you a links roundup related to this event. For some perspective--my own--I was born the year before the first people walked on the moon, an event known as the Moon Landing. That day was such a big deal that in a photo book of baby images capturing my first year, six dim Polaroid photos of the moon landing take up the entire last page, fuzzy, blurry images of our ancient Zenith television, including one of an Earth-bound Walter Cronkite (I still miss that man) wiping his face in disbelief. As someone who was born in the mid-20th century and knew and lived with people born in the 1800s, I am in awe of what I'm seeing today in the second decade of the 21st century. You can relive that moment from 43 years ago in the video below. You might even recognize the real-life versions of some of the characters who featured in Apollo 13, one of my favorite movies. I also am a fan of Janet Armstrong's hair in this video. The entire clip sequence is typical '60s news television and features a strikingly young Mike Wallace. Armstrong is on the moon at around 9:39. "One small step for man... "
The moon is a mere 238,900 miles away from us. We could practically fly there on a space plane (assumes this biologist). But Mars? That's 350 million miles. The rover we just dropped on the planet, using technology with shades of the latest Star Trek movie, will spend a planned two years roving the red planet, sending back data about what it finds. The Great Hope, of course, is that one thing it will find is signs of Life. 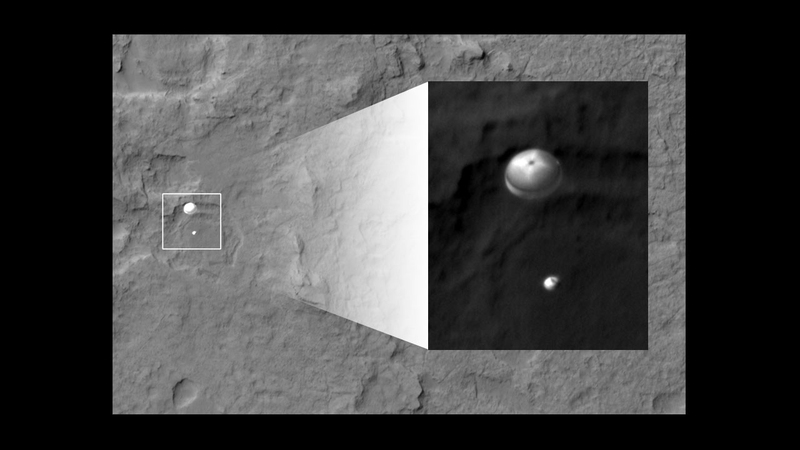 Now, enjoy this video of the successful Curiosity landing from the wee hours this morning. "Thumbnails complete! We've got thumbnails! Woohooooo!" My favorite quote: "You can see dust particles on the window!" 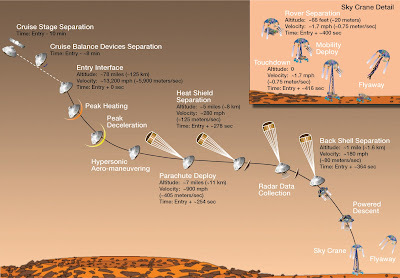 Then, visit NASA's page dedicated to the Rover Curiosity, where NASA's posting great images from 350 million miles away. Our own physics editor, Matthew Francis, has a post up over at his blog, Galileo's Pendulum, giving a personal perspective on this historic event. He's also included links to a post by Emily Lakdawalla telling us what comes next for Curiosity and to ArsTechnica's retrospective overview of Mars missions. The L.A. Times, near ground zero of mission control, has a lengthy piece complete with links to photo essays. Worth exploring and enjoying. 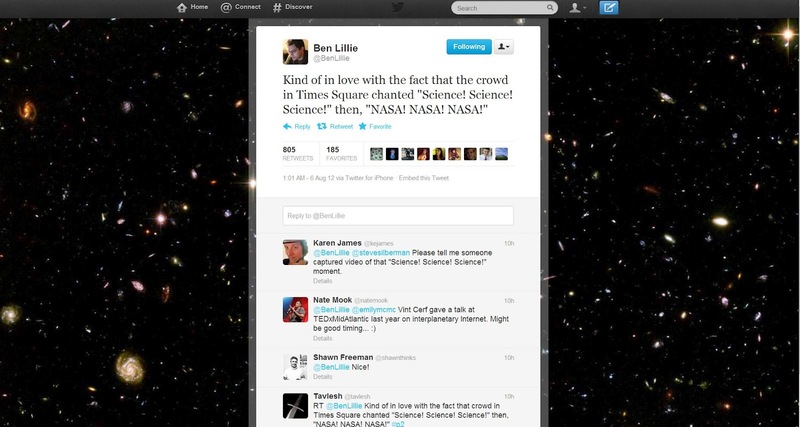 Science, FTW! We sure have come a long way since 1969, baby.